Love the bar stools. Where are they from? Thank you so much. I am going to make a purchase!! 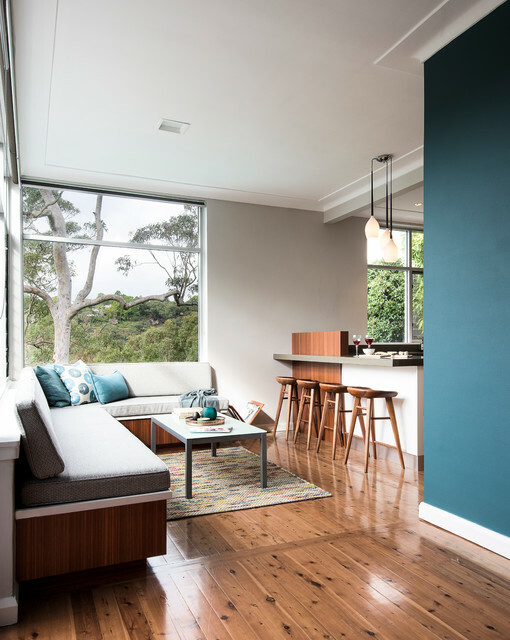 What is the colour of the beautiful feature wall? vanilla quake strength - Do you recall the strength of vanilla quake used? Was it 1/4, 1/2 or full strength? Thanks again! Yes, it was full strength Vanilla Quake. Hi, thanks for your question. The teal colour is from Dulux and is called Jimbaran Bay (P32A7) and the grey colour is Vanilla Quake. Kind regards, Karen. How about this for a view demo front door? Like the color of wood floor with grey color.